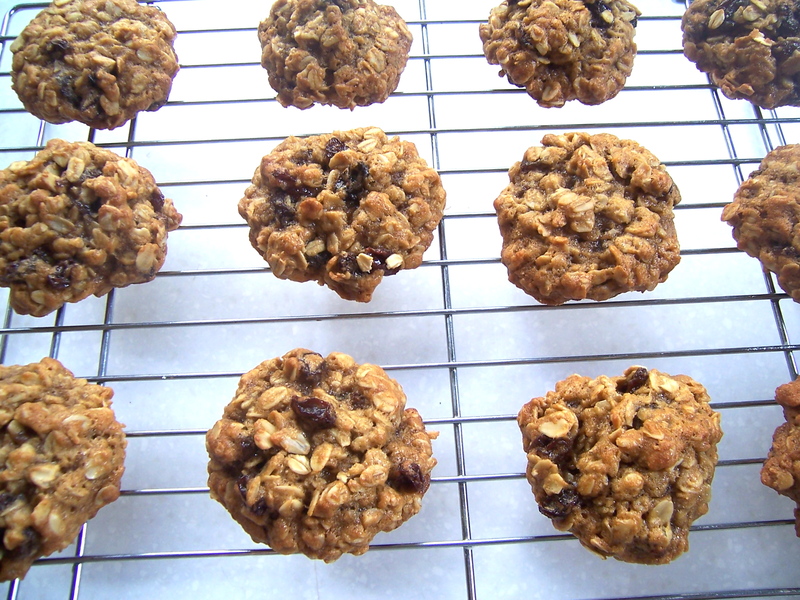 Oatmeal Raisin cookies count as breakfast thanks to the star ingredients. That’s my story and I’m sticking to it! However, these cookies are so good it will be hard not to eat them around the clock. 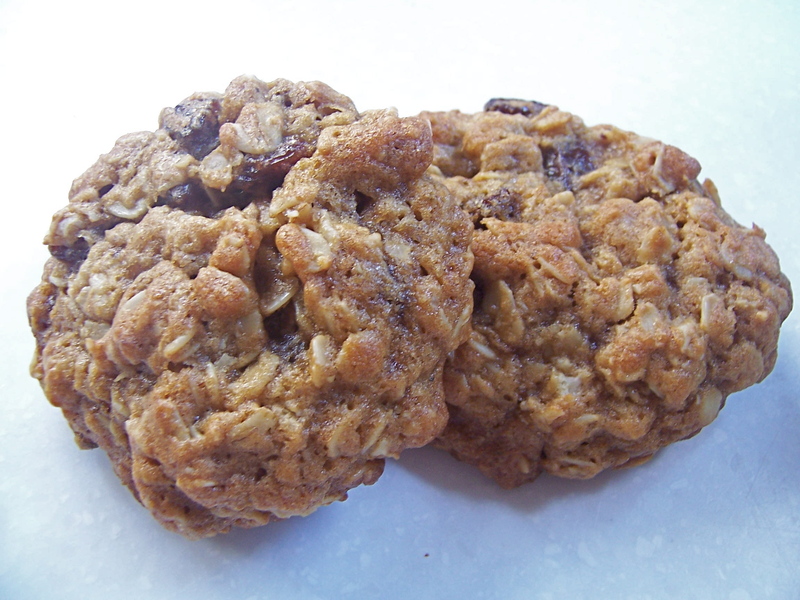 I was never a huge fan of oatmeal raisin cookies, but as you grow up your taste changes, and I have definitely come to appreciate this chewy, oaty, cinnamony treat. The past few mornings we have experienced that chill in air that foreshadows autumn. I love that, don’t you!? It makes you want to put on a cozy sweater, snuggle, put a pumpkin on your doorstep, and if you are like me, it also makes you want to make fall-ish foods. Oatmeal cookies fall (haha, no pun intended) into that category. For a cookie they are quite hearty, and of course I put cinnamon (my favorite spice, remember?) and nutmeg in them, which remind the palette of apple pie and other fall inspired baked goods. So, the other morning, with my kitchen windows open to let in the romance of autumn, I baked these oatmeal raisin cookies. Can you tell I LOVE fall? You too will feel the love when you bite into one of these. This recipe is slightly adapted from Smitten Kitchen, a wonderful cooking/baking blog that I frequent. I added nutmeg and doubled the recipe so I could make a bunch of big honkin’ cookies for sharing with friends and fam. The result was a beautifully thick and chewy cookie with a perfectly spicy taste. Preheat oven to 350 degrees fahrenheit. Line cookie trays with parchment paper. In a large bowl, cream together butter, brown sugar, eggs, and vanilla. In a medium bowl, whisk together flour, baking soda, cinnamon, nutmeg, and salt. Combine this dry mixture into the butter mixture. 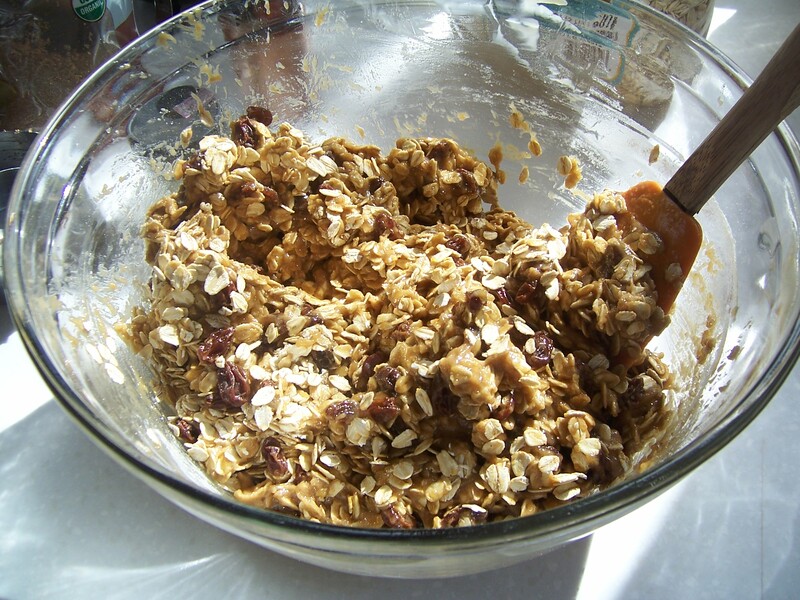 Once combined, stir in the oats and raisins (and whatever else you are adding such as nuts or chocolate chips). If your raisins are on the harder side you can boil them in water for about ten minutes and it will soften them up. Mine were nice and soft though. The trick to getting thick chewy cookies is to chill the dough (this also works with other cookie doughs!). I like to chill the tray as well as the dough, my thought process being that the cookies will start to spread if the tray is warm. But, you can just chill to dough and it also works well. I used an ice cream scoop to measure my cookies and the result was a multiple-bite, very thick cookie. Put dough on parchment lined cookie trays about 2 inches apart. Bake for 10-15 minutes depending on the size of your cookie. Take them out when cookies are golden around the edges and look slightly undercooked on the top. Put trays on cooling racks and let the cookies sit on tray on the tray for five minutes before transferring.